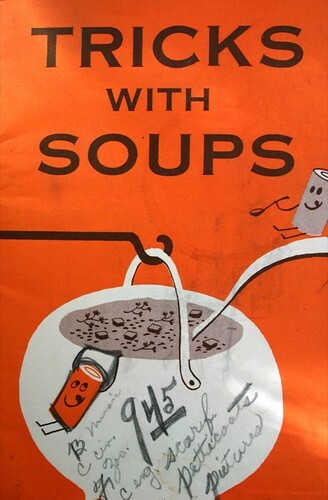 This beauty was published in 1956 by….wait for it…Campbell Soup Company! I know it’s shocking, isn’t it? 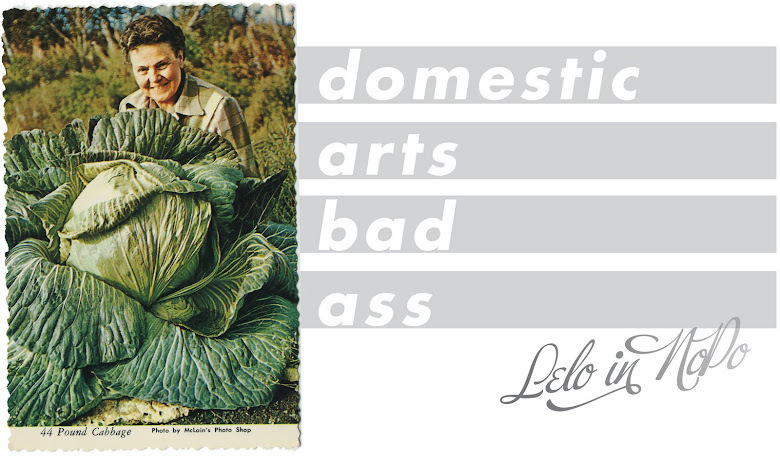 But let’s pause here for a moment and take in this link. And you know, I can see a lot of that, right? But then I look at the sodium content of that link I shared up there, and all those things in there that I don’t really even know what they are, and I back away a little bit. Is cream of mushroom soup the devil? No it is not. But I’m fascinated in how a product like cream of mushroom soup has become synonymous with the casserole. If we go a little further back in time, say to this publication, published in 1942. 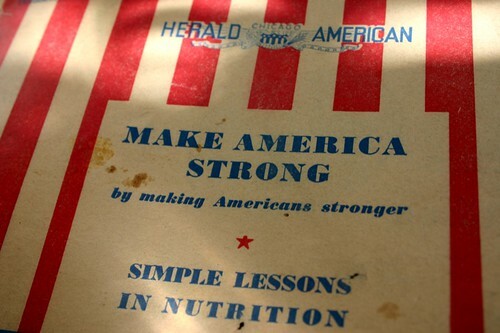 Published as a wartime piece, this Chicago newspaper steered readers to frugality as well as ensuring a well rounded meal with all food groups represented. 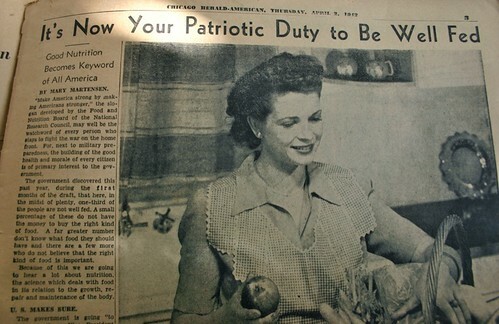 It's your patriotic duty, of course. This casserole recipe sites frugality and a well rounded meal, when eaten with a green salad. There’s no cream of mushroom soup here, just a reference to a well seasoned medium white sauce. I love this series! So many things that make me giggle and remember the way it used to be! SO amazing! 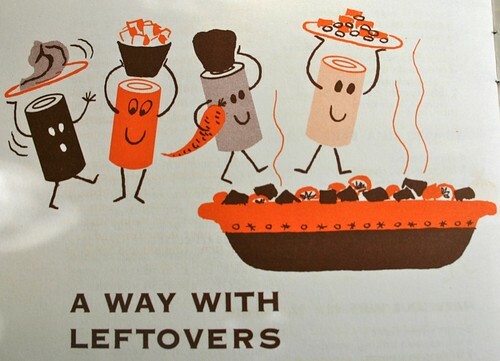 I love the can illustrations so much! Great post. 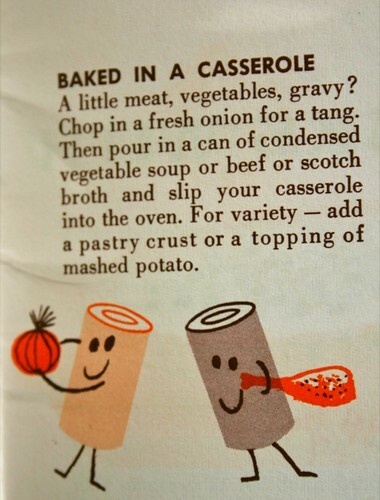 I adore casseroles and NEVER use a can of soup! My girlfriend makes the most amazing casserole. She combines any leftover meat (or none if there is none) with whatever is ripe in the garden, chops it all up, saute's it and adds a handful of parmesean cheese and some half and half or whipping cream and bakes it in a pie shell. Last summer we had green beans, zucchini, carrots, leeks, baby onions, tomatoes, chicken, kale, basil, potatoes and sweet pepper casserole. It is simply heaven.